The accusations range from salaries falling short of the national minimum wage rate to workers receiving wages two weeks later than the stipulated date. The conduct of local private security firms has worried the employment ministry following several accusations by employees of a potential breach of employment law. The male-dominated industry depends mostly on unskilled workers, a majority of who are national minimum wage earners. It was largely an under-regulated sector until Government passed the Security Industry Decree (2010), which required security companies to carry licences. But Minister for Employment Opportunities, Productivity and Industrial Relations, Jone Usamate, warns of further scrutiny after receiving “emotional and heart wrenching” complaints by some security guards. The accusations range from salaries falling short of the national minimum wage rate of $2.68 to workers receiving wages two weeks later than the stipulated date. Some guards say despite working on rates of less than $2.68 an hour, salaries are deducted without reasons. Complaints are never raised with employers for fear of termination, the guards say. “The security industry is one of our biggest areas of complaints,” Mr Usamate said at meeting with employers yesterday in Suva, adding that many were operating illegally. Professional Security Services managing director Vijay Prakash concedes there certain bad players in the industry. He believes the best solution would be to name and shame the operators once they are brought to justice. Minister Usamate said: “I have instructed my staff to go hard after people who are not complying with employment law. “I think employer that are giving security contracts must also show some responsibilty as well. 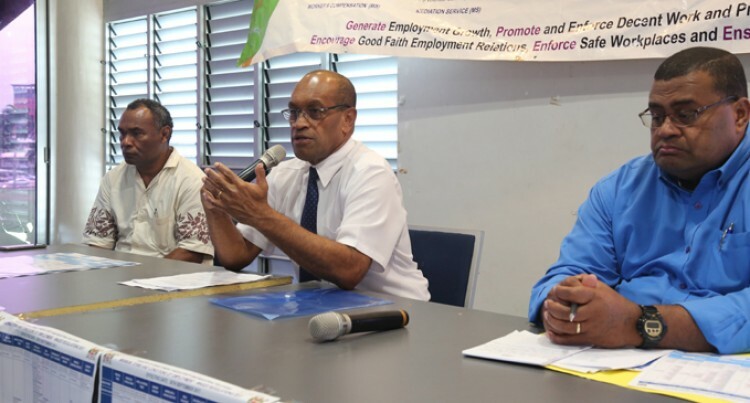 In Fiji’s first ever national employment policy, Government is aspiring to improve the quality of employment in the country as part of its commitment to International Labour Organisation. Mr Usamate has been holding consultations with employers and workers throughout the country during the past month. The new employment policy will be one of the most important national schemes Mr Usamate will oversee during his term as minister.